Speed up your order entry on your Ubercart site by allowing your customers to access all of your products on a single page. This is especially useful for sites where the customers are ordering in mass quantity such as filling orders for distributors or where there may be many items on a single order. Not likely useful for browsing the products and clicking on order now. We have developed a multiple item order form to allow your customer to select multiple items from an order form and clicking on the submit button to load items and quantities to the Ubercart cart. We will release this module to the Drupal modules when it gets some more polish on it and after it has been used on our production servers for a while. If you would like to have this module for you Ubercart site please contact me through this web site and we will package it into a module for you. This module does not use VBO. The options I found for VBO all seemed to fail for one reason or another. 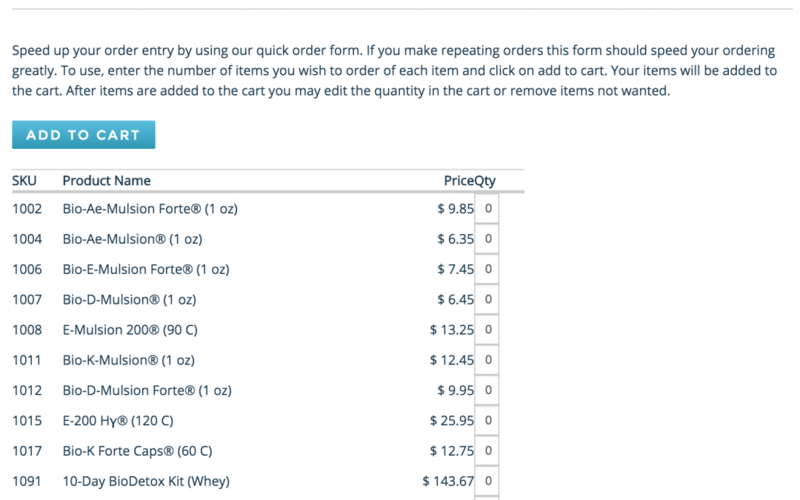 Using this form a user can fill in quantities for all items in the catalog and then click on Add to Cart. Each item with a Qty set to other than zero will be loaded to the shopping cart. In our first deployment of this module we also allowed the customer service team for the client using to use this to build orders for their clients on the phone. This has shorten the mass orders being called in to seconds of computer time vs 10 to 15 minutes.